Danny C. Foux, 72 of Vidor died Saturday, April 6, 2019 at Baptist Hospitals of Southeast Texas in Beaumont. A native of Beaumont, he was a longtime resident of Vidor. Danny attended Church of Jesus Christ of Latter-Days Saints and was an iron worker with Gulf Coast Machine Shop for 42 years before he retired. 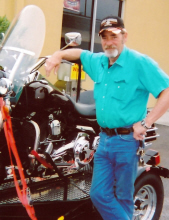 He enjoyed motorcycles, woodworking and fishing, but most of all he loved his family. Visitation will begin at 6:00 pm Wednesday, April 10, 2019 at Memorial Funeral Home of Vidor. Funeral services will be held at 2:00 pm Thursday, April 11, 2019 at Memorial Funeral Home with burial to follow at Del-Rose Cemetery. Danny was preceded in death by his 1st wife Judith Foux. He is survived by his wife of 12 years Joyce S. Holden Foux of Vidor, TX, sons Mark Foux and his finance Carla of Vidor, TX, Steve Foux and his wife Rosemary of SC, David Foux and his wife Sara of LaBelle, TX, and James Foux and his wife Donna of Beaumont, TX, step-daughters Amber Wolfe and her husband James of Vidor, TX and Joyce Louise Henry of Orange, TX, 13 grandchildren , 5 step grandchildren and numerous great grandchildren. To send flowers or a remembrance gift to the family of Danny Carl Foux, please visit our Tribute Store. "Email Address" would like to share the life celebration of Danny Carl Foux. Click on the "link" to go to share a favorite memory or leave a condolence message for the family.